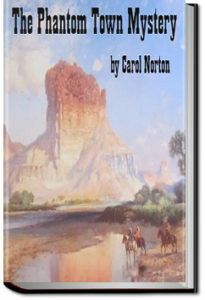 Two girls from the East, out on a horseback ride in the mountains of Arizona, find a house in the mountains. The house’s history reveals that an eccentric miner once lived there. As they turn to leave, a gunshot goes off. Dora vows to solve what she and Mary call the Evil Eye Turquoise mystery. That evening two male friends and the two girls visit an old storekeeper who knows a lot about Lucky Loon, the man who once lived in that strange mountain house. The storekeeper tells them how the house owner, Sven, lost his sister during a stagecoach holdup. Ever since the loss, he had prospected successfully after gold and turquoise, always searching for his missing sister. Sven set up a large turquoise stone to guard his house of riches. Supposedly anyone who tried to enter Sven’s house would be detected by the Evil Eye Turquoise and severely punished. As Sven neared death, he decided to await that moment by sealing himself in a vault in the house. But before that, he wrote a letter to his sister in case she ever showed up. The next morning after the storekeeper’s tale, the four go out for further investigation. They progress up the mountain road in an old car until they get to where the stagecoach was robbed. They go over a cliff to a ledge. What they find is or you to learn, and what unravels in this tale remains for you to discover. This entry was posted in Reading on September 17, 2017 by all-you-can-books.